THE PHANTAGRAPH AND SCIENCE FICTION REVIEW AND LE VOMBITEUR AND SCIENCE FICTION WEEKLY AND MIND OF MAN AND X AND FANTASTORY AND FUTURIAN NEWS AND CURIOUS STORIES AND SO FORTH eleventh year -- fandom's oldest Donald A. Wollheim, Editor & Publisher 98-50 67th Avenue, Forest Hills, N.Y. Vol. 13 No. 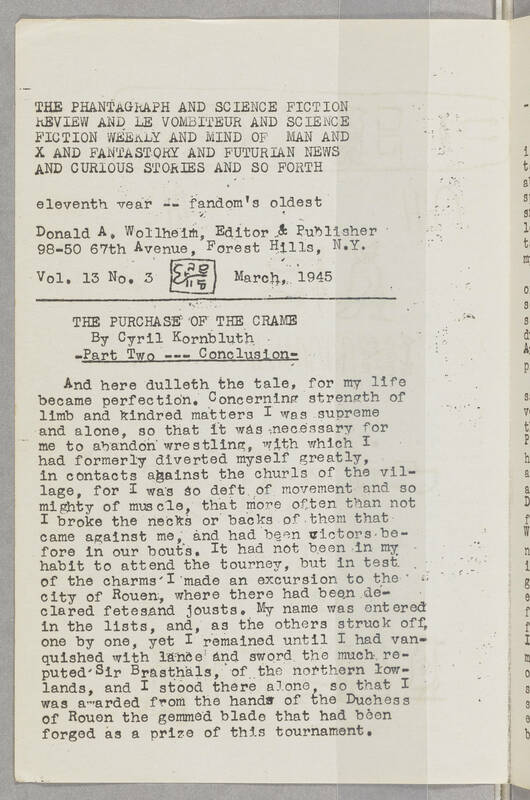 3 March, 1945 ________________________ THE PURCHASE OF THE CRAME By Cyril Kornbluth -Part Two --- Conclusion- And here dulleth the tale, for my life became perfection. Concerning strength of limb and kindred matters I was supreme and alone, so that it was necessary for me to abandon wrestling, with which I had formerly diverted myself greatly, in contacts against the churls of the village, for I was so deft of movement and so mighty of muscle, that more often than not I broke the necks or backs of them that came against me, and had been victors before in our bouts. It had not been in my habit to attend the tourney, but in test of the charms I made an excursion to the city of Rouen, where there had been declared fetes and jousts. My name was entered in the lists, and, as the others struck off, one by one, yet I remained until I had vanquished with lance and sword the much reputed Sir Brasthals, of the northern lowlands, and I stood there alone, so that I was awarded from the hands of the Duchess of Rouen the gemmed blade that had been forged as a prize of this tournament.